If you ask me why I wanted to go to Armenia, the answer is a simple one: because it was close to Georgia, and I wanted to go there. But, if you’re asking why I think you should go to Armenia, my answer is completely different. Allow me to explain. Lured by the drama of the Caucasus Mountains, a visit to Georgia was a no-brainer. When I discovered I could travel between the two capitals (Tbilisi in Georgia and Yerevan in Armenia) in less than a day, an add-on trip to Armenia began to take shape. But, as I was planning to see a lot more of Armenia, I settled on making Yerevan my base for a few days and seeing some of the country’s other sights as day trips. Envoy Hostel had a lot of excursions to choose from, but its private rooms were booked out. Not wishing to stay in a dorm bed, I opted for the centrally located and newly opened Ibis instead, right in the city centre. Fortunately Envoy were quite happy to let me book their trips as a non-guest. 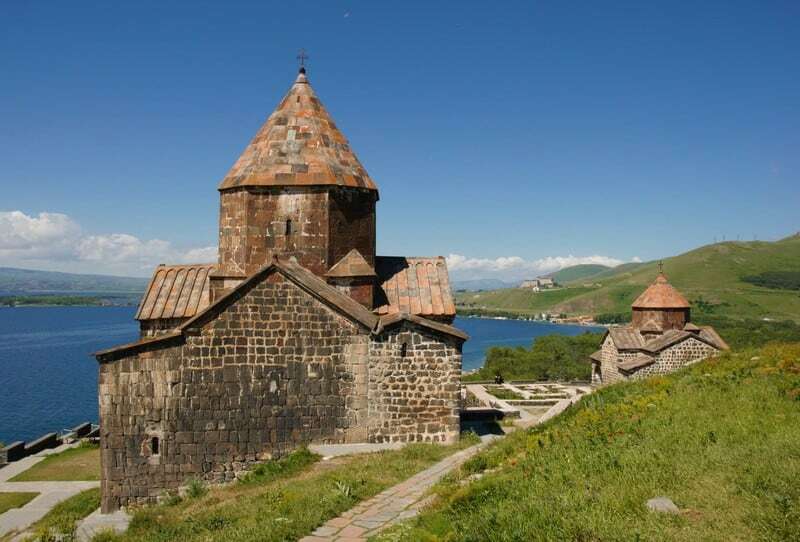 One of Envoy’s most popular tours was the one they called Enlinking Caucasus, which provided a transfer service from Tbilisi to Yerevan with stops on the way. It seemed like a pretty good way of exploring the north of Armenia without the need to backtrack. 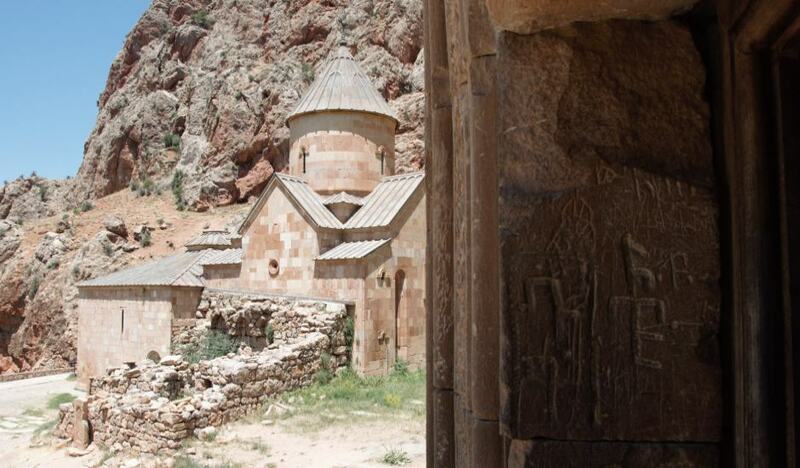 The tour took us first to Haghpat, where I’d get my first lesson in the key characteristics of an Armenian monastery. 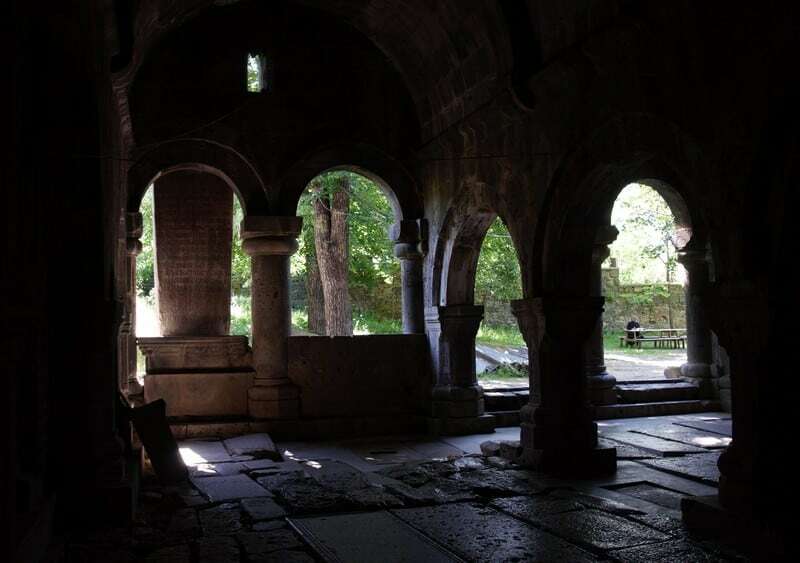 For instance, most feature a “gavit” or entrance hall, where the floor is covered with graves. Located in the Debed Canyon and built in the 9th century, the monastery was a treat in grey stone topped with terracotta roof tiles. Inside, the floor was littered with holes, which I learnt were used to store wine. Next, to nearby Sanahin, whose name translates as “older than that one” – a nod to the rivalry between it and Haghpat. We were encouraged to walk on the graves. Far from being an insult, it was considered helpful – by treading on the stones, you would free the dead of their sins. I stomped away for a while, happy that this tradition did not require me to take on that burden of sin myself. Once I reached Yerevan, I hopped on Envoy’s Essential Armenia tour, figuring that was a logical place to start. By minibus, we took in serene Lake Sevan, Armenia’s largest. 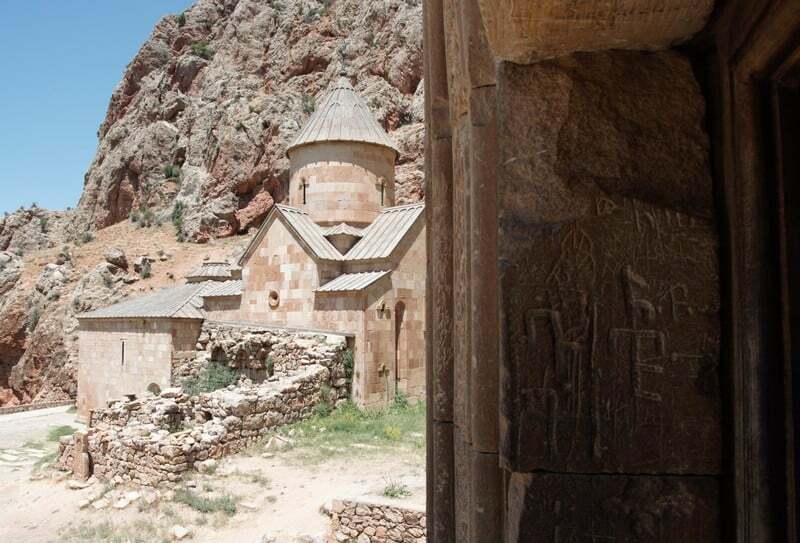 Its most famous visitor attraction is the Hayravank monastery. To reach it, there was a climb of a considerable number of steps. I was dubious, but when I reached the top, the views across Lake Sevan and the countryside that surrounds it were ample reward for my efforts. 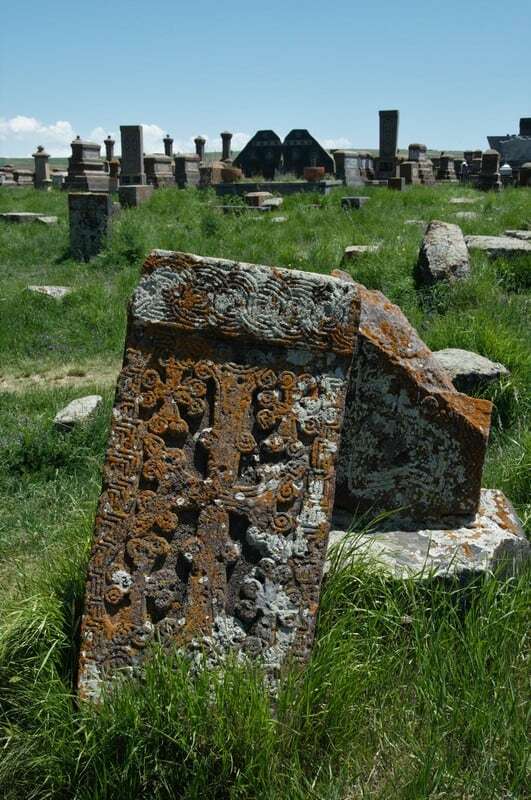 Descending to lake level, we visited the Noratus cemetery, packed full of the engraved stone headstones known as khatchkhars that I would see throughout my travels in this, the oldest Christian country in the world. Geghard monastery and Garni temple would round off the day. Finally, it was time to take the Enlightened Armenia tour. Again, there were monasteries to see, but far from being sick to death of them, each had sufficient character to be engaging. Khor Virap was marooned on a hill overlooking a vast plain, yet its backdrop was biblical Mount Ararat, across the border into neighbouring Turkey. Even more breathtaking was Noravank, as its church was constructed over two storeys with the narrowest of staircases fixed to its outer wall. Vertigo sufferers beware – there was no handrail and it was a worrying climb. The view from the upper floor across the canyon was worth the fear and then some. Armenia had been tacked onto my Georgia itinerary without much thought. On paper, the idea of spending day after day visiting monasteries might not be everyone’s idea of fun. But it was so much more than monastery-hopping. In reality, the warmth of the welcome I received from the Armenians and the ease of seeing such incredible scenery made this one add-on I was glad to have made.